Provide your students with morning meeting activities focused on common themes in literature to encourage social and emotional growth, character education, and community building at its best with Morning Meeting Made Easy Set 1. Themes include: belonging, kindness, compassion, conflict, and perseverance. Engage your students with activities like read alouds, whole group discussions, videos and song lyrics, quotation analysis, self-assessment and personal reflection to strengthen your #classroomcommunity. 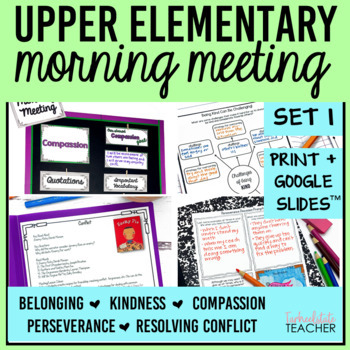 With Morning Meeting Made Easy, you are able to incorporate personal development and classroom community building while targeting common themes in literature and your grade level's ELA standards. My students develop a strong understanding of theme because of our morning meeting lessons! ➥ Learn more about the Structure and Design of My Morning Meeting Routine! 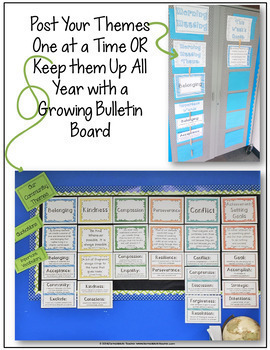 Check out my FREE BELONGING and INTEGRITY themed morning meeting resources to get a closer look at how each theme is designed and the supporting resources you receive. Copyright © Tammy Roose, Tarheelstate Teacher. 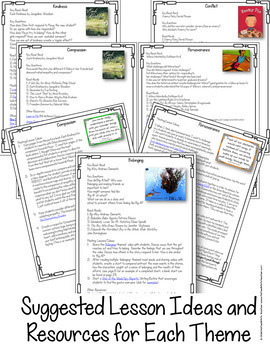 The purchase of this resource gives the buyer permission to download and copy for single classroom use only. Electronic distribution is also limited to single classroom use. Copying for other teachers, school-wide use, or school systems is only allowed with the purchase of additional licenses that can be added through your account under "My Purchases" at a discounted price.